Welcome to Getaway on Gordon! The TV is hidden behind the Japanese panel art. View of the living room. Spend a night in and cook a meal. French doors open up to the balcony. The dining room is open to the living area. 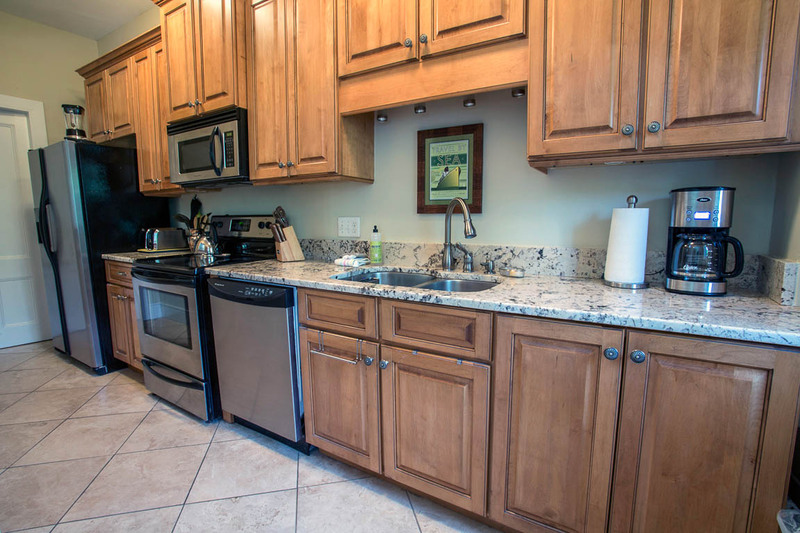 Granite counter tops and stainless steel appliances. The kitchen is fully equipped with everything you'd need. Plantation shutters allow for privacy. Unpack your suitcase and stay a while. The bedrooms can open up to each other. The shared bath has a tub/shower combo. The second bedroom has a Queen size bed. Watch TV from the bed. Walk outside to your private balcony. View of the private upper balcony. Have lunch under the shaded patio table. 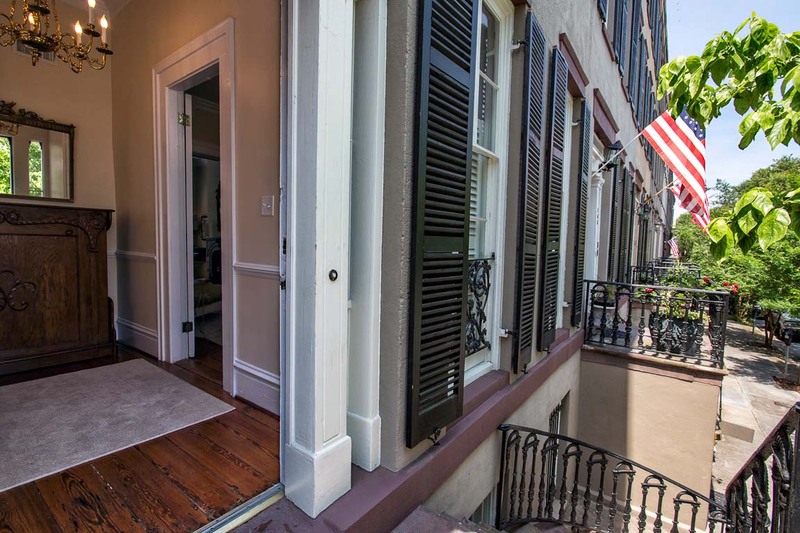 Welcome to your historic Savannah row house. This home is on the corner of Whitaker and Gordon. Walk to some of the city's best shops and restaurants. Some of Savannah's best architecture can be found on Factor's Walk. 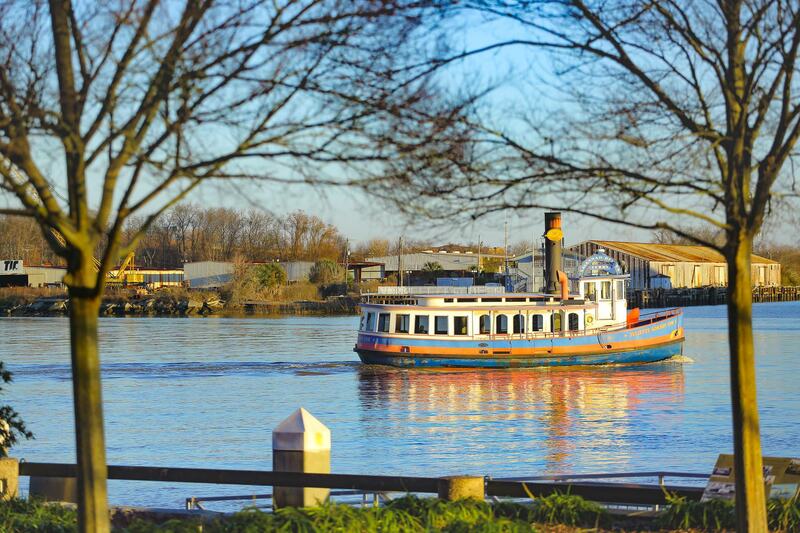 Take a ferry along the river. 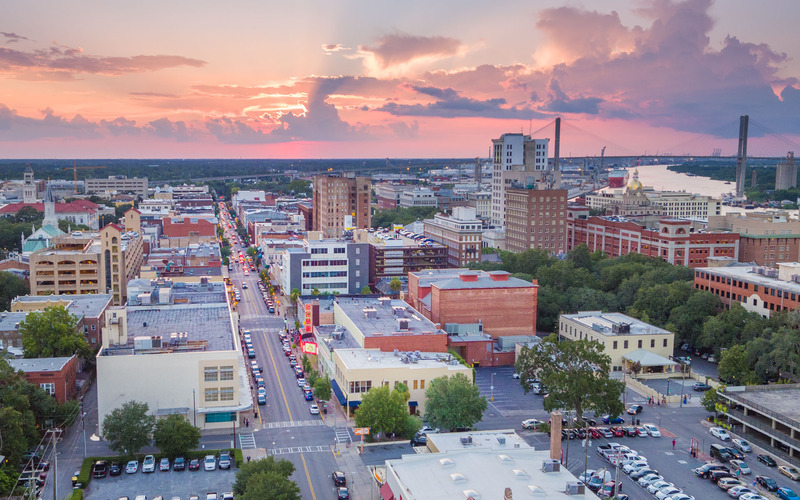 Downtown's shopping and dining destinations are a short walk away. Historic downtown awaits! 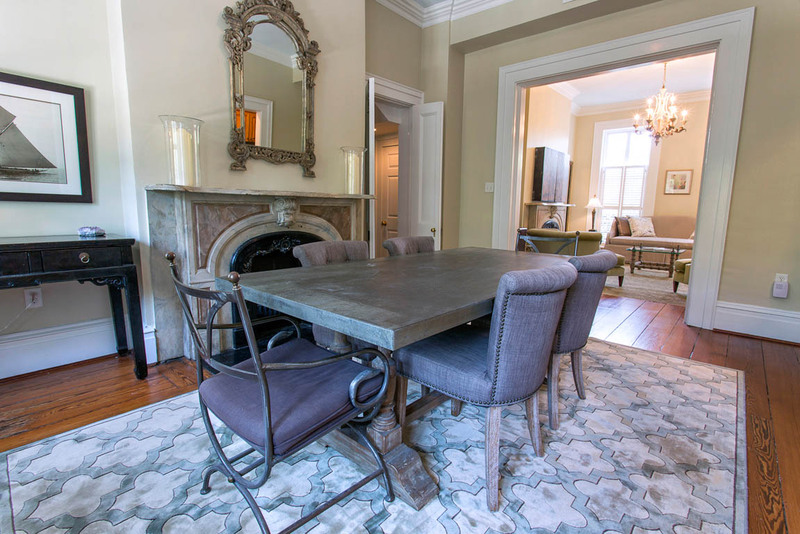 Located on the second story of a black-shuttered row home, this stylish apartment is just north of Forsyth Park in the Historic District. 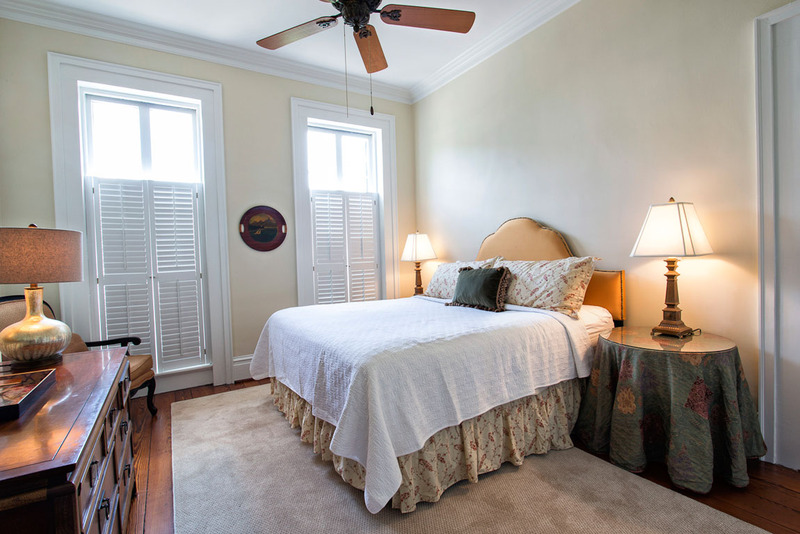 Its prime location makes it the perfect spot for up to four Lucky guests who want to live like the locals during their Savannah getaway. 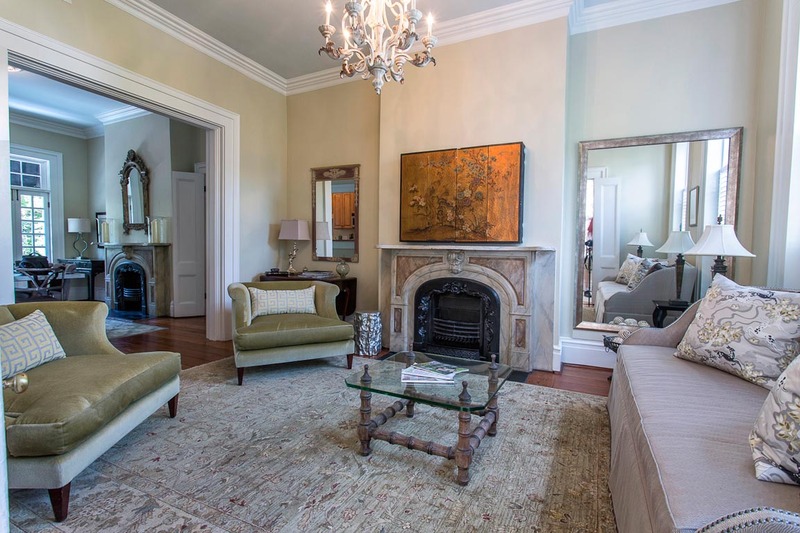 The richly appointed living area boasts tons of original architectural details, including marble mantles, crown molding and oversized pocket doors. Elegant finishes and softly upholstered furnishings create a comfortable yet upscale décor. 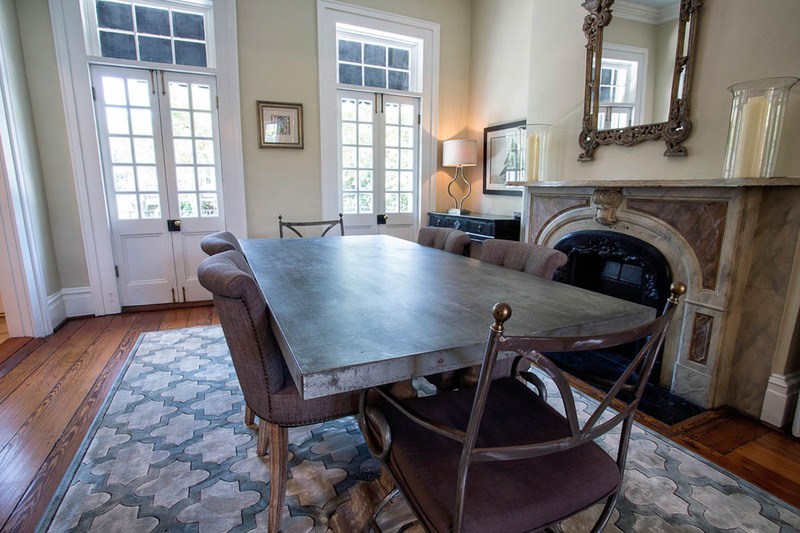 The adjacent dining room has a large table with seating for six and two sets of French doors to let in the sweet Savannah air. A convenient pass-through connects you to the fully equipped kitchen. 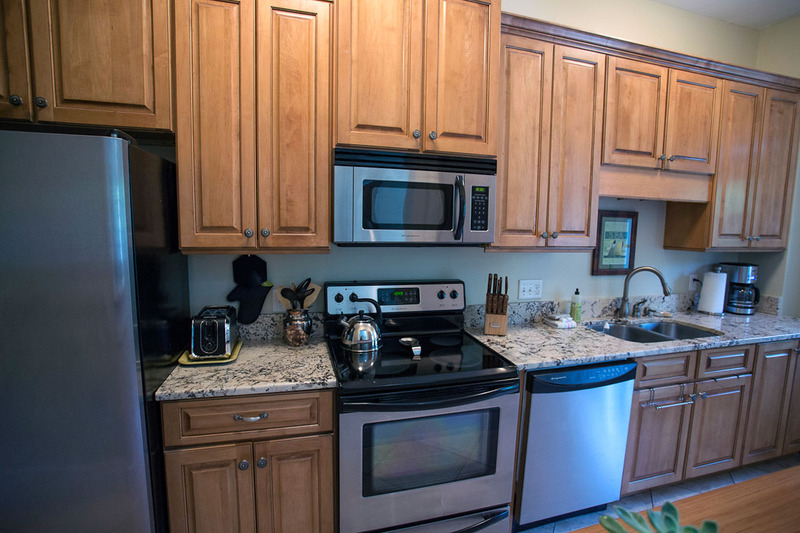 You’ll find every modern convenience including stainless steal appliances and new cabinets. 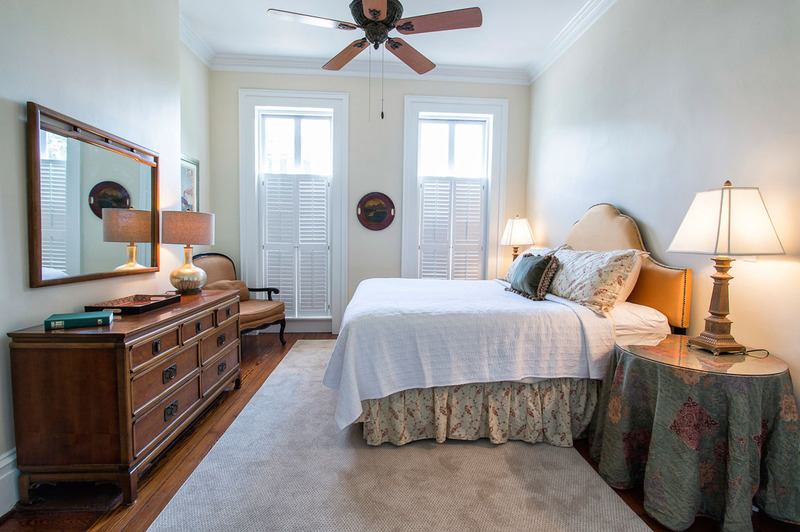 The Master bedroom has a king size bed with a plush upholstered headboard, large dresser and plenty of closet space. Large windows let in plenty of natural light, but have slated window coverings for privacy. The second bedroom has a queen bed, as well as a sofa and flat-screen TV. The shared full bath has a tiled tub/shower combo. 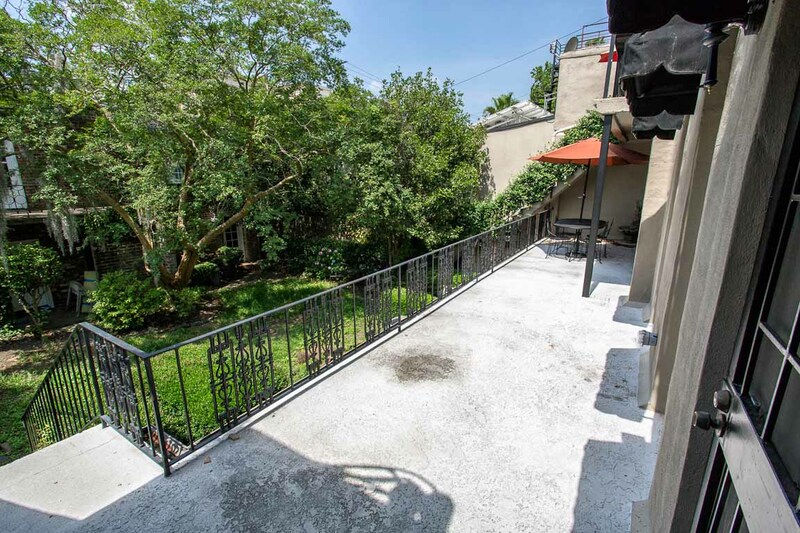 Outside, you’ll find a large deck overlooking the shared courtyard with lush landscaping below. A shaded table and chairs are available so you can enjoy your meals al fresco, or regroup with a cocktail after a long day taking in the sights. This Lucky property is the ideally located if you’re interested in any number of historic and modern attractions. Browse for antiques at Alex Raskin’s, or tour the famous Mercer-Williams House on nearby Monterey Square. Mix with locals and find fresh ingredients for dinner at the Farmer’s Market on Saturdays in Forsyth Park. - Be sure to visit legendary Savannah eatery, Mrs. Wilkes Dining Room, just down the street for some authentic Southern home-style cooking. 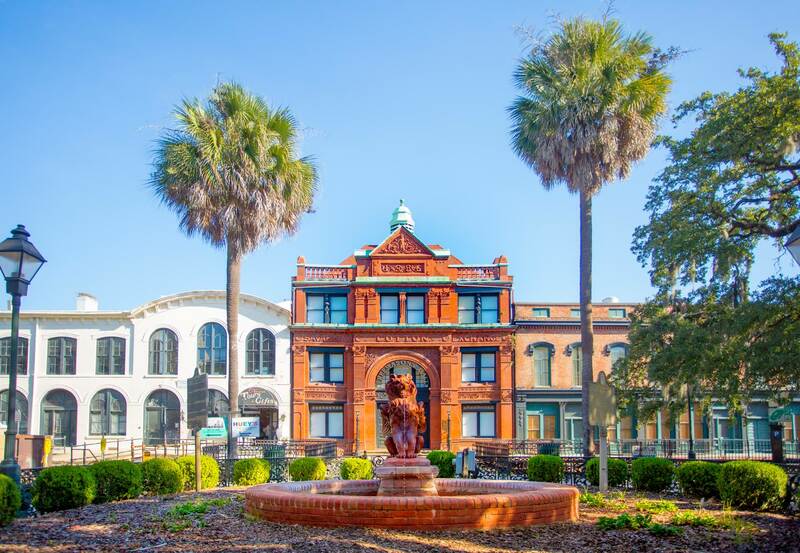 - You’ll be close to Forsyth Park, Savannah’s largest green space and a popular location for festivals, concerts, and weddings. Great location, close to amenities and beautifully decorated. 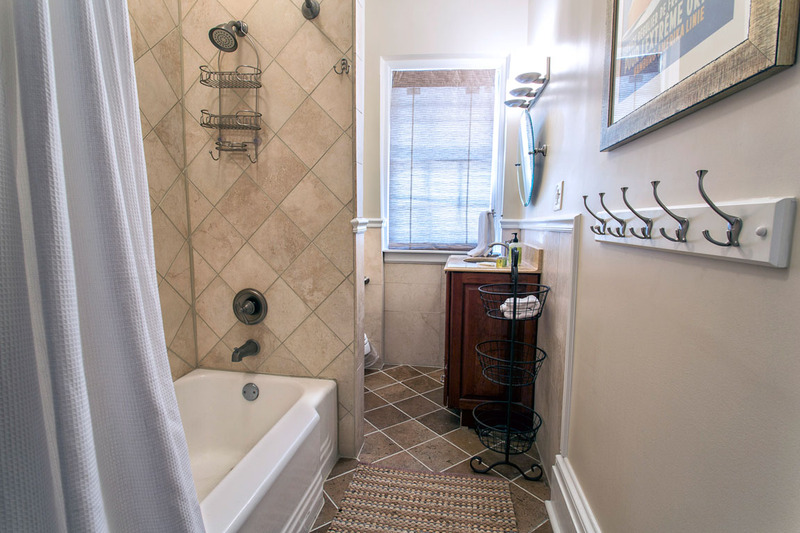 Ample space for 4 adults (as long as 1 bathroom doesn’t bother you). There is a lot of road noise in the house, but it was never an issue when sleeping or in the evening at all. The rental had everything we needed and more! Historiacal & Beautiful. Much of the original home was restored and the modernized parts were done well. Everything was provided that we needed for our stay. The management company quickly responded to our one AC issue. The home is very well stocked with kitchen supplies and having the washer and dryer was fabulous. It is in a perfect location for walking everywhere. The place was even prettier than the pictures. Perfect location. Great location and easy walking distance to many things around town. Place was very clean and large. I would definitely recommend. My only complaint is that being on a corner, you can hear the noise of people and cars but nothing terrible. Also, there is only street parking near this unit. We down loaded an app to keep paying for our spot. But neither of these are the rental agency fault and it would not deter me form staying again. Spent a few days here in March 2019. Lovely apt with comfortable beds and furniture, and plenty of room. The balcony overlooking and with access to the yard was an unexpected bonus. I don't hesitate to recommend the Getaway on Gordon. Thank you for choosing to stay with us, Corinne! We've forwarded along your feedback to the appropriate parties and look forward to hosting you in a quieter part of town next time! This was the perfect place for 2 couples. Check in was a breeze, Lucky Savannah sent ample information ahead of time to make our arrival seamless. The property is GORGEOUS inside. Beds were incredibly comfortable. I loved the outdoor space (read each morning in the courtyard). Forsyth Park was steps away from us. I would stay here again in a heartbeat! Thank you for staying with us, Kelly! We're so happy to hear that you enjoyed the home and our service. Looking forward to hosting you again soon! We spent a long weekend here with our teenage son who was touring SCAD. 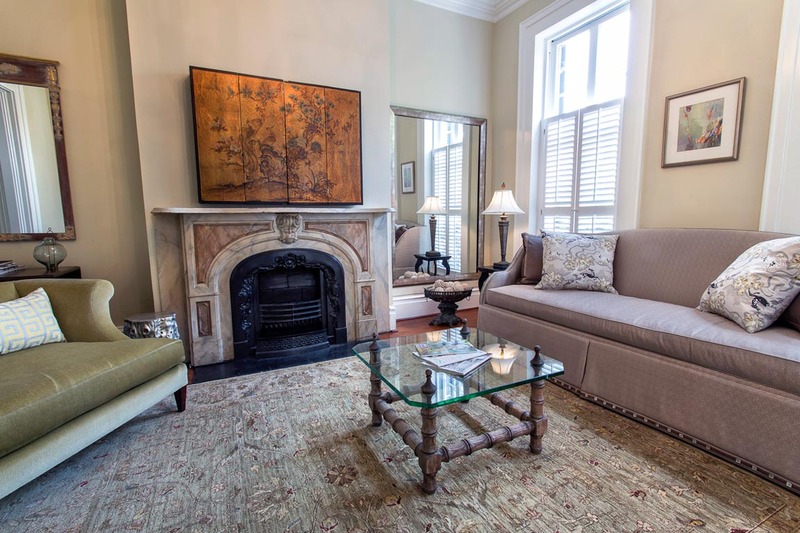 The apartment was beautiful and in a perfect location for exploring Savannah. We especially enjoyed having coffee and breakfast on the veranda eat morning. 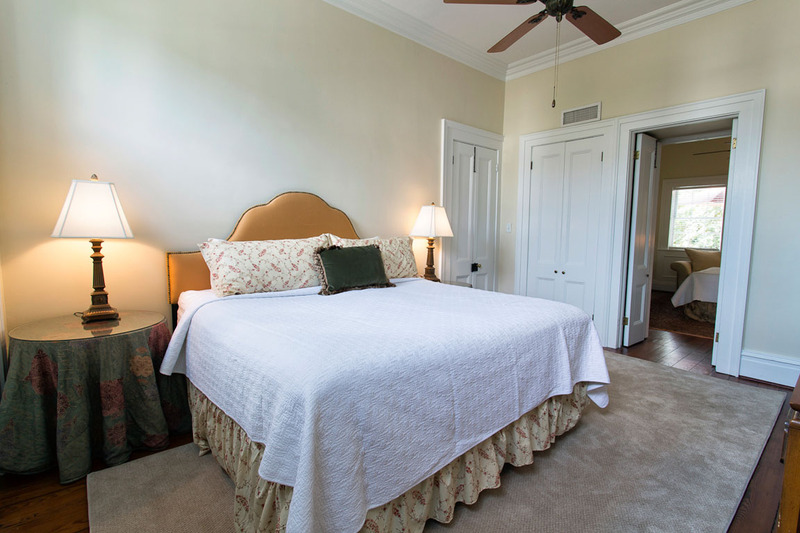 The location is ideal for enjoying Forsyth Park and the historic district and an easy walk to the river too. We will definitely be back and quite frankly had a hard time leaving! Lynn, thank you again for choosing Lucky Savannah while your son toured SCAD! We look forward to hosting you again next time. Gloria, thanks again for choosing Lucky Savannah! We're so happy to hear that you enjoyed your time at Getaway on Gordon. Please know you're privy to a Return Guest discount next time you stay with us. This is a charming, well equipped vacation rental. 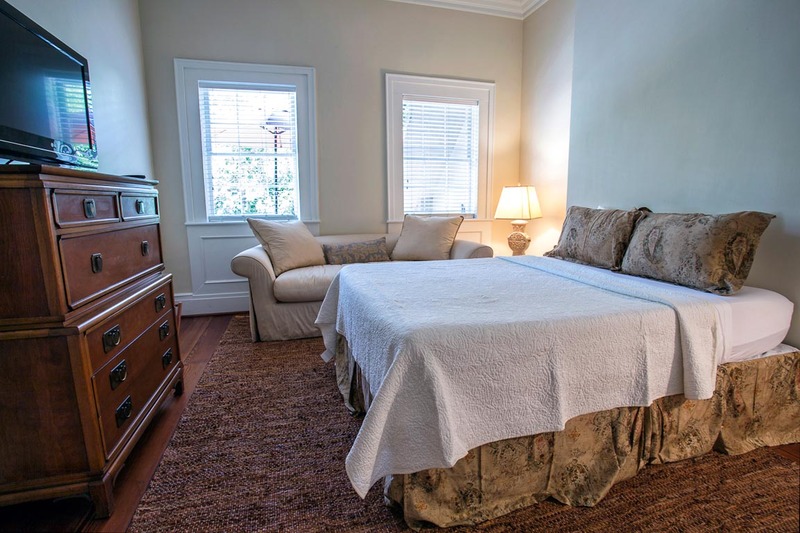 It is in an ideal location, 1/2 block from Forsyth Park and within easy walking distance from many sites. Bring some quarters for the meters and pay attention to the street signs. Parking was not an issue for us. The building was quiet and comfortable (although a little on the chilly side, but we are from Florida!) We only wish there had been one more extra blanket. Anil, thank you for choosing Lucky Savannah! We're so glad to hear that you enjoyed Getaway on Gordon. Next time, give our team a call and we'll happily drop by with an extra blanket. We had a great time at Getaway on Gordon. We were 5 minutes from the ST. Paddy's Day parade, a 15 minute close walk to city market, and an easy 5 minute drive to everywhere. The windows are a little dated so a lot of noise got through to the front bedroom on Friday and Saturday, but the noise was considerably less once the festival folks left town Sunday. Sunday night was quiet and Monday night we barely heard a peep outside. The residence is beautiful and has everything you need. 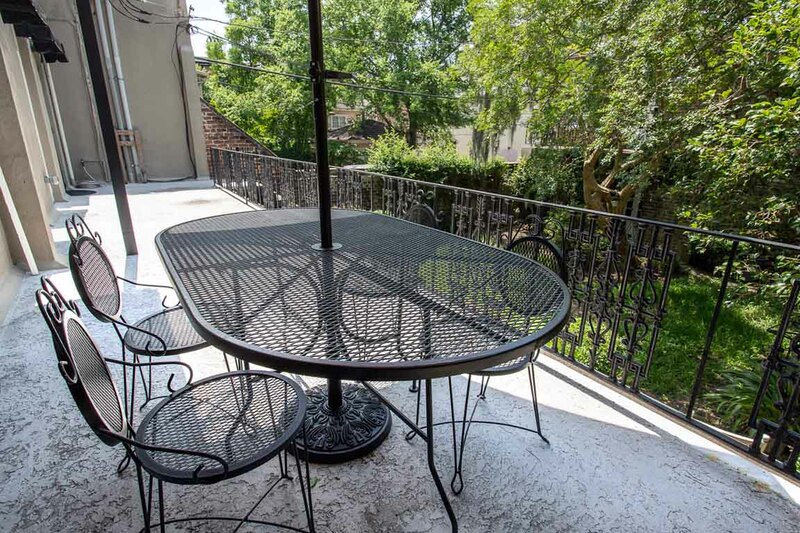 The outside patio is wonderful for evening reading or sipping wine while gazing at the courtyard. A great place! We stayed on Gateway on Gordon for three nights in the end of March and enjoyed it very much. For historic place it's super spacious and comfortable. You could see a little bit of a park from the balcony. Kroger store is within a walking distance and the kitchen is enough to put a simple dinner together. We loved having dinners on the patio! Adjacent street is busy, but it did not bother us. Lock box broken. Very inconvenient. Television in left side bedroom is glitchy. I needed to tap television to get picture. Bit of a struggle to understand operation of main room television set. Better instructions would be helpful. Beautiful property in historic district. Spacious. One of the TVs didn't work and it took 2 days for repair but overall management was very responsive. We would absolutely recommend this property. Thank you for choosing to stay with Lucky Savannah! We are so glad to hear you all found the home to be spacious and in a great location. We do apologize for the delay, but we are happy maintenance was able to take care of that for you! We thank you for the recommendation and hope to have you all again soon. Everything in the apartment was upscale including the linens and furnishing. The only problem was the front door being hard to open and close which we figured it was from the hurricane humidity from just a few days prior to our arrival. The review lists this as a one bedroom when in fact it was a two bedroom we shared with another couple we met up with to vacation with. The company even asked if we wanted to get a refund of our monies because of the hurricane that hit just days before or they would adjust our days to stay which we opted for. Hands down the nicest place we have ever stayed. Hi Russell and Rachel! Thank you so much again for choosing to stay with us. We're so glad to hear you enjoyed Getaway on Gordon and our beautiful city, even after Hurricane Matthew. We pride ourselves on being more than a vacation rental company and are pleased to hear that our staff was helpful during your stay. Please know that you're privy to our Friends and Family discount next time you stay with us. Looking forward to hosting you again soon! The house was very accommodating. The rooms, kitchen and other facilities were exceptional. Although the house was very old, the upkeep was to our liking. I would certainly recommend or stay there again. Great location only a block from Forsythe park,it has a nice porch on the back,wish I had known I would have brought my bikes, the house was nicely decorated,but a couple of the rugs were dirty, plenty of parking available on the street. overall a good place to stay. Great location. Short walk to waterfront. Grocery store a few blocks away. Awesome weekend! Hi Michael! Thank you so much again for choosing to stay with us. We're so glad to hear you enjoyed Getaway on Gordon and our beautiful city. Please know that you're privy to our Friends and Family discount next time you stay with us. Looking forward to hosting you again soon! I appreciated the app. We got in late, but still had no trouble. The home was beautiful, the neighborhood perfect. The beds were incredibly comfortable and the home had all the amenities. Internet worked well. I would stay again in a heartbeat. I absolutely loved this location I'm a local and just needed a stay cation. 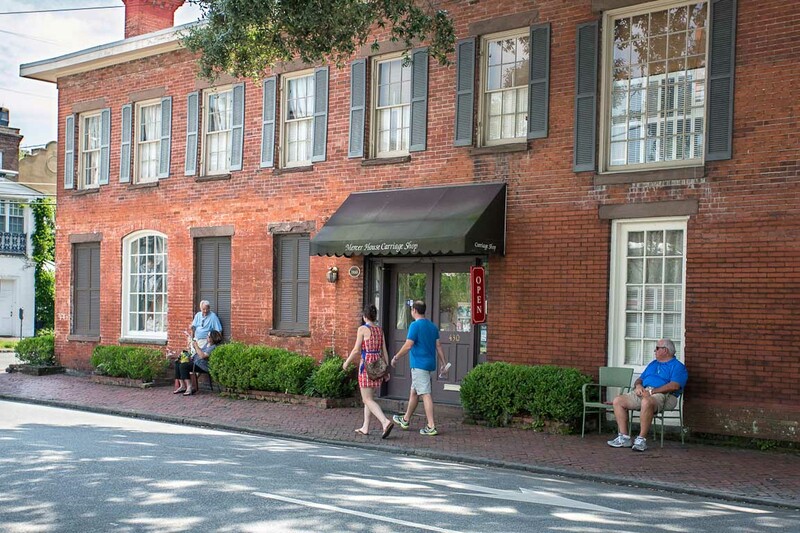 Great spot in historic Savannah within walking distance to all the shops and restaurants. Home is very comfortable will upgrades throughout it felt like a home away from home. Great stay. Only problem was the entry door was hard to open. Loved walking the historical area. Hi Teresa! Thank you so much again for choosing to stay with us. We're so glad to hear you enjoyed Getaway on Gordon and our beautiful city. Please know that you're privy to our Friends and Family discount next time you stay with us. Looking forward to hosting you again soon! Beautiful property in great location! We were in town for the Rock and Roll Marathon and had an outstanding experience with this rental. The home is very convenient to downtown attractions (restaurants, bars, parks, etc.). 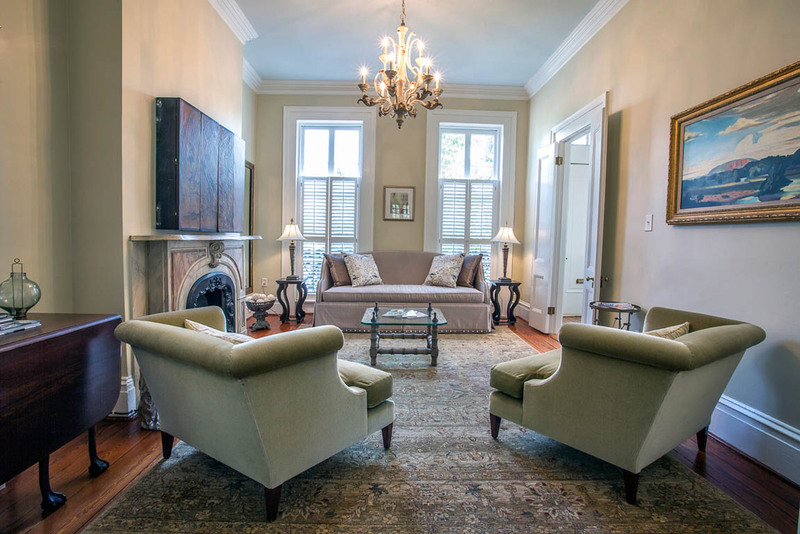 The property is gorgeous with lots of architectural details and was clean and spacious. Although it advertises one bedroom, it has two. We would definitely recommend this property to others! Hi Rich! Thank you so much again for choosing to stay with us. We're so glad to hear you enjoyed Getaway on Gordon for your marathon weekend. Please know that you're privy to our Friends and Family discount next time you stay with us. Looking forward to hosting you again soon! Convenient, comfortable on beautiful Chatham Sq. 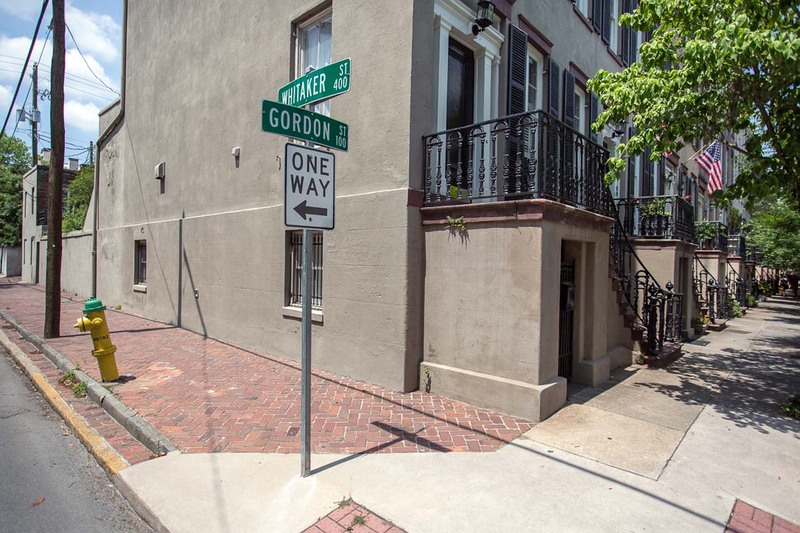 Very nice home in our favorite area of historic district as we like to walk to as much as possible and avoid the high tourist area of riverfront. Helpful to have two distinct bedrooms as traveling with adult daughter. Lovely to have coffee on veranda in courtyard. Nicely appointed. A couple of things could've bumped it to a 5 star stay. First, the area rug in entry way is badly stained. It should be switched out as it is unwelcoming in an otherwise pretty property. Second, although the house was clean, closer attention needs to be paid to kitchen items. Many of the dishes and coffee cups had been put away dirty. Hi Lisa! Thank you so much again for choosing to stay with us. We're so glad to hear you enjoyed your stay at Getaway on Gordon and have made note of your suggestions. Please know that you're privy to our Friends and Family discount next time you stay with us. Looking forward to hosting you again soon! Let me say the location was great. We parked the car and walked everywhere without it. You are close to all the parks and places to eat, all are within a short walk. My only ding on the property is the location to Whitaker street. There is a crazy amount of traffic on this street which does not allow one to relax completely. Parking is a nightmare as well since you need to pay hourly or go to the visitors center for a 2 day pass. We needed tow passes. Bathroom is small and would be difficult if more than 2 persons stayed at the property. It was a great stay just beware of the unexpected extras. Hey Randall! Thank you for choosing to stay at Getaway on Gordon. We do understand that parking can be an issue downtown, and are happy to hear that you still had a great time in our beautiful city. We hope you'll allow us to host you in a more residential part of town next time. This was a wonderful location with comfy beds. The place had an ant issue in the kitchen and bathroom and the property management company was prompt in sending an exterminator. Beautiful place! Our toddler wakes up early and the downstairs neighbor was not fond of our early morning noise so they banged on the ceiling a lot. Hi Arin! Thank you again for staying at Getaway on Gordon. We're happy to hear that our staff responses promptly to those minor issues, and look forward to hosting you again soon. Great covered outside space. Spacious interior. Thanks for staying with us, Linda! Great stay in Savannah. Felt almost like home! Terrific place. Beautifully decorated and wonderful size. The location couldn't have been better. So glad we chose to stay in Savannah over Charleston since this place was accessible to everything. Our stay exceeded our expectations. 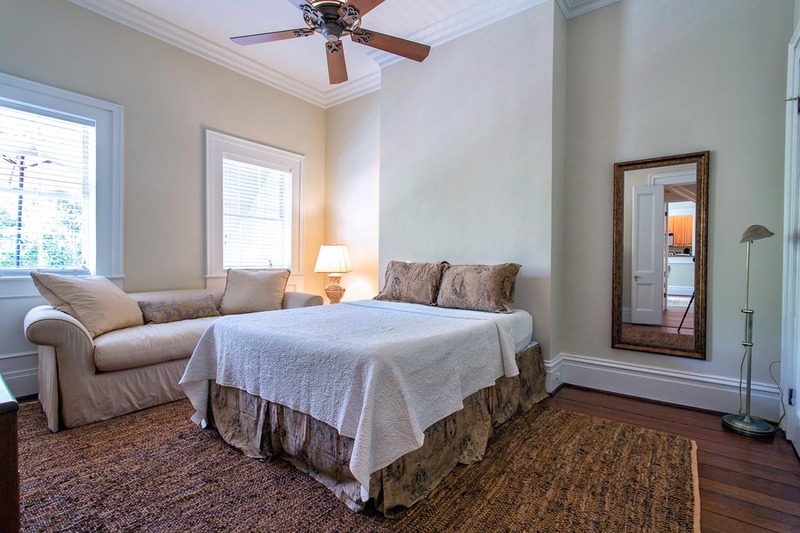 This is a wonderful location, with Forsyth Park just around the corner and everything in the historic Savannah within walking distance. Except for a trip to Tybee, we never needed our car. The place was immaculate and Lucky's team did a great job of communicating and taking care of us. The Lucky app is very helpful. The getaway on Gordon is in a great location. Walking distance (or pedicab) to almost anywhere in the hisoric district. About a block away from Forsyth park! The rental unit is beautiful and very clean. It had everything we needed and was very comfortable. On street parking was easy to come by. Would highly recommend this place and company! 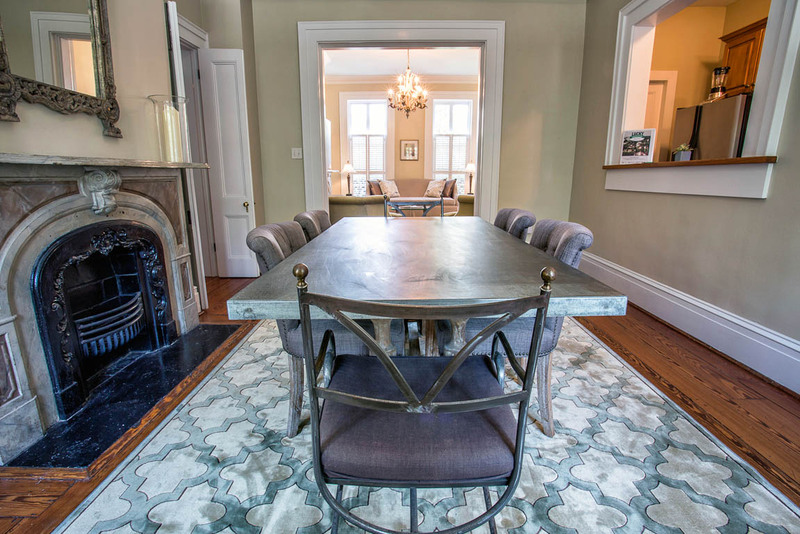 Everything about this property was well done, from restoration to furnishings. The courtyard blocked most of the usual Savannah street noise, and offered a buffer when enjoying the outside seating area. 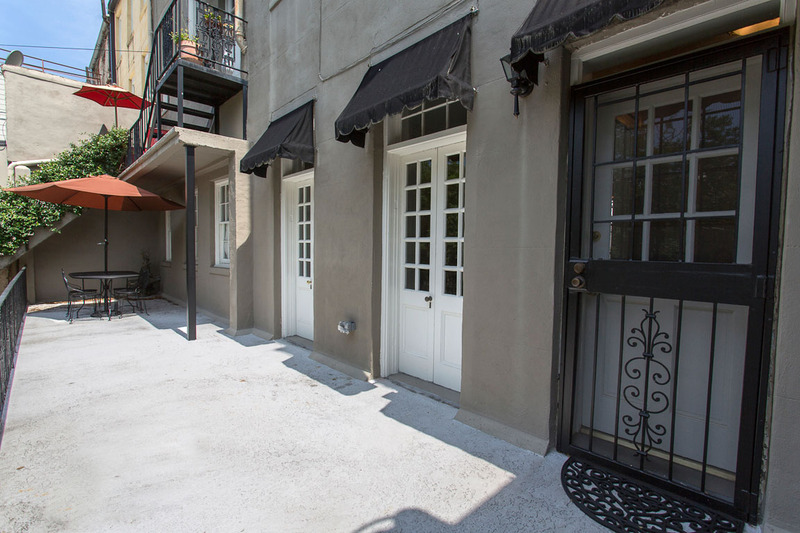 The location is convenient to Forsyth Park, restaurants and shopping. We visit Savannah often, and this is our favorite property so far. While you can hear footsteps from the upstairs apartment, it is not terribly intrusive. Truly a great experience! Thank you for choosing to stay with Lucky Savannah! Getaway on Gordon is a quaint home, located in a fantastic location. We are so glad you were able to enjoy this home, and found it to be "well done". Lucky Savannah hopes to have you all again soon! 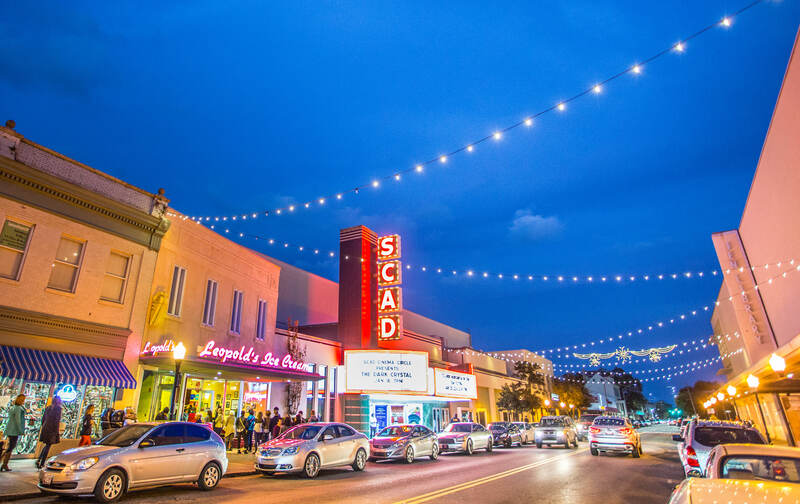 Our second time in Savannah, this time to move in our daughter to SCAD. One more time, we stayed in one of the Lucky Savannah's rental property. Getaway on Gordon was perfect; my family and I love it, AGAIN!!! The customer service, property, location, city, people, food were all great! We'll return to Savannah to see my daughter and definitely will call Lucky Savannah again! Thanks Joshua Dean for your help! Love from Puerto Rico! Everything about this rental was the best. Location could not be beat. One block to Forsythe Square. We walked to everything we wanted to see as well as restaurants. Spotless and very inviting. Kitchen was totally equipped (bring Crab crackers if you plan to bring uncracked crab home to eat. We used a scissors but crackers would have been nice). Managers were extremely helpful and responded immediately. Parking was accessible right in front. We got a pass from the city so we did not have to feed the meter during the week. Just heed the warning to not park on certain sides of the street on Friday and Saturday nights because of street cleaning. We knew but forgot and got a ticket. Our bad!! You can't go wrong with Getaway on Gordon!! Thank you for choosing to stay with Lucky Savannah! We are thrilled to hear you all found the location to be great. We are glad the home was spotless and inviting for your stay. We sure hope to have you all as our guests again soon.